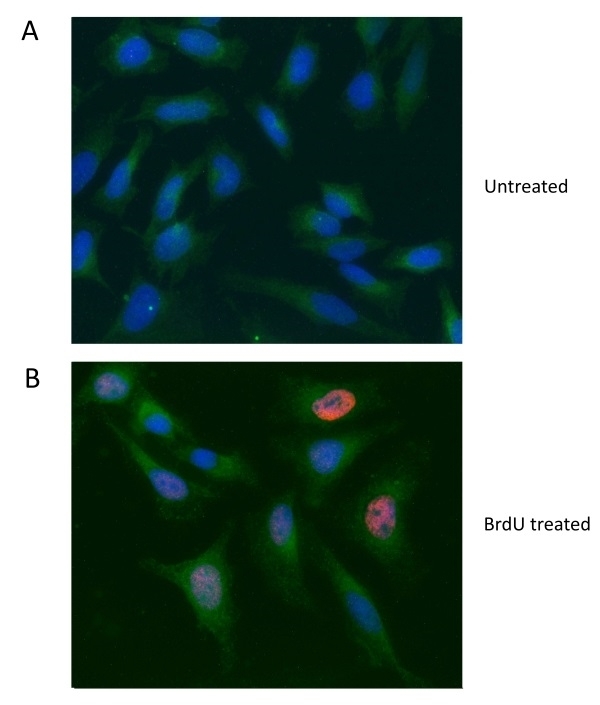 HeLa cells were treated with 10 µg BrdU for 1 hour (B) or left untreated (A). Cells were stained with mouse anti-BrdU antibody, clone Bu20a (MCA2483) at a dilution of 1/25. As a secondary antibody, goat anti mouse IgG (H/L) DyLight® 549 conjugated antibody (red) (STAR117D549GA) was used at a 1/50 dilution. Cytoplasm was stained with rabbit anti-GAPDH antibody (AHP1628) at a dilution of 1/100. 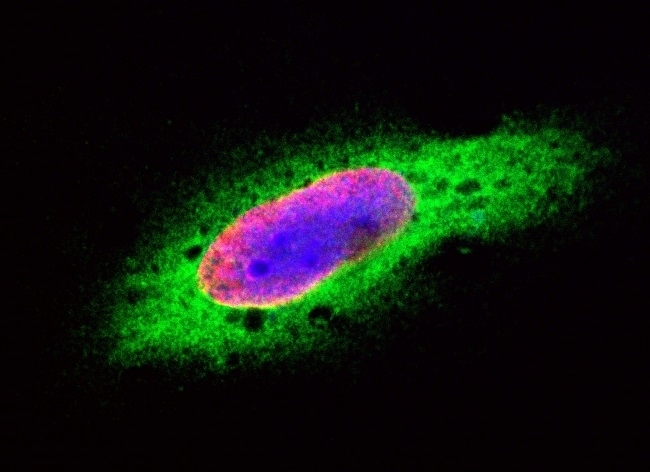 As a secondary antibody, sheep anti rabbit IgG DyLight® 488 conjugated antibody (green) (STAR36D488GA) was used at a 1/50 dilution. PureBlu™ DAPI (1351303) was used as nuclear counterstain. Rabbit anti GAPDH antibody (AHP1628) used to evaluate GAPDH expression in murine tissue lysates by western blotting. NUCB2 is expressed in the small intestine, large intestine and liver of male C57BL/6 mice. Tissues show distinct bands for NUCB2/nesfatin-1 corresponding to 50 kDa. Rat nesfatin-1 (Custom synthesized, ABGENT, 1 μg/μL) was used as a positive control which is shown as a distinct band corresponding to 10 kDa (A; Left Image). Mouse glyceraldehyde 3-phosphate dehydrogenase (GAPDH) is uniformly expressed in liver, small and large intestine. The blots that were loaded with 50 μg of total protein/well previously for NUCB2 protein detection were stripped and re-blocked with mouse GAPDH primary antibody. Representative blot (n = 4 independent experiments) showing distinct bands for GAPDH corresponding to 37 kDa (A; Right Image). Mucosal cells showing NUCB2/nesfatin-1 (Texas-Red) immunoreactivity, and DAPI are found in the small intestine (B; left image) and large intestine (B; right image) from male mice. Arrows point to cells that are immunopositive for NUCB2/nesfatin-1 and shows distinct DAPI-stained nuclei. Representative images were taken of 4 slides (8 sections/tissue) from three adult male mice. Scale bar = 100μm. 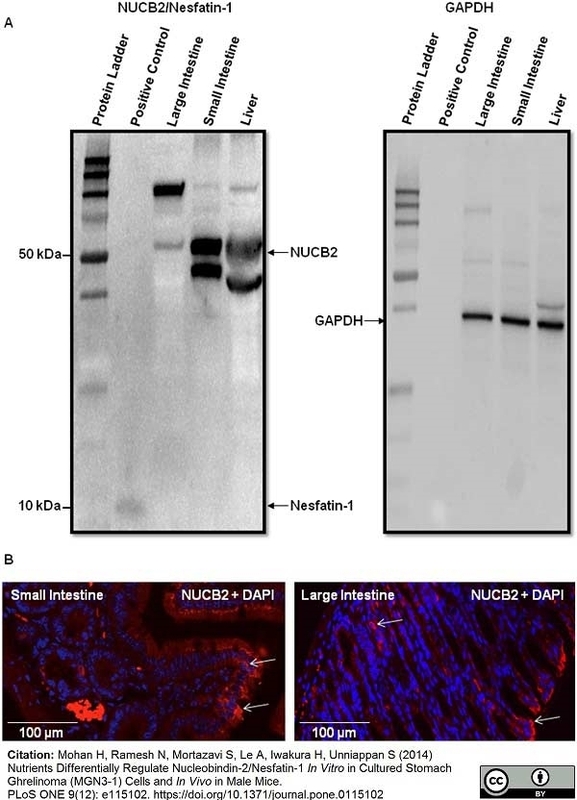 Nutrients Differentially Regulate Nucleobindin-2/Nesfatin-1 In Vitro in Cultured Stomach Ghrelinoma (MGN3-1) Cells and In Vivo in Male Mice. 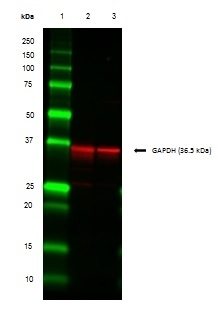 Rabbit anti GAPDH (N-Terminal) antibody recognizes human glyceraldehyde 3-phosphate dehydrogenase (GAPDH). GAPDH is a major glycolytic enzyme within the cytosol, which is also involved in a number of intracellular processes including membrane fusion, microtubule bundling, phosphotransferase, DNA replication and DNA repair. GAPDH may be involved in the cellular phenotype of age-related neurodegenerative disorders such as Alzheimer’s and Huntington’s disease. Antiserum to human GADPH (N-Terminal) was raised by repeated immunisation of rabbits with highly purified antigen. Purified IgG was prepared from whole serum by affinity chromatography. A peptide corresponding to a 16 amino acid sequence from near the amino-terminus of GAPDH. AHP1628 detects a band of approximately 40kDa in HeLa cell lysates. Rogalska, A. et al. (2014) Epothilone B induces extrinsic pathway of apoptosis in human SKOV-3 ovarian cancer cells. Toxicol In Vitro. 28: 675-83. Paré, B. et al. (2015) Early detection of structural abnormalities and cytoplasmic accumulation of TDP-43 in tissue-engineered skins derived from ALS patients. Acta Neuropathol Commun. 3 (1): 5. Mohan, H. et al. (2014) Nutrients differentially regulate nucleobindin-2/nesfatin-1 in vitro in cultured stomach ghrelinoma (MGN3-1) cells and in vivo in male mice. PLoS One. 9 (12): e115102. Nevzorova, Y.A. et al. (2017) Anti-tumorigenic and anti-angiogenic effects of natural conifer Abies sibirica terpenoids in vivo and in vitro. Antonucci, J.M. et al. (2016) SAMHD1-mediated HIV-1 restriction in cells does not involve ribonuclease activity. Nat Med. 22 (10): 1072-1074.